I've recently found the story of Rifleman John Thomas Hardcastle, 21st Battalion KRRC - one of the original yeomen of the Yeoman Rifles. He died soon after being taken POW in the Battle of the Dunes on 10 July 1917 (Nieuport Bains) - he'd been posted to the 2nd battalion KRRC six months after being wounded at Flers with his original battalion, which he had joined in November 1915 when it was founded as part of the New Army. He's not actually a relative, but I had always heard of him - without until recently knowing his name or any details - as the man my great-aunt Annie Chester should have married, but lost in the Great War. His family were married into both sides of my mother's family and they were all farmers from near Ripon in Yorkshire. After 7th October on the Somme according to the KRRC Chronicle 'the Yeoman battalion ceased to exist. Of its original officers and men few were left, and it was completed by drafts composed principally of Londoners.' Hardcastle missed that day because he was still recovering from wounds received at Flers on 15th September. I would very much like to hear about any other men from that original recruitment exercise in November 1915. Most of them must have been killed on the Somme, while a few perhaps transferred to other battalions, like Hardcastle, after being wounded. Who might he have known during that year (not even a year, but it must have been a very intense period in their lives) with the Yeoman Rifles? PS EDIT Ripon was in the WEST Riding, though it's north Yorkshire. As you would expect therefore, Hardcastle was in B Company. When I went back after looking at hundreds of records I saw 'B Coy' on his medical history sheet, faded but fairly clear. Mark, many thanks for your kind offer to be a guinea pig - I think I'll need a few experiments. Perhaps there should be a tutorial thread on this subject? Perhaps there is one? Thank you for the supplying the link to the discussion about Hardcastle's record as a POW. As by this time he was in the 2nd Bn I am assuming he may no longer have had any of his original 21st Bn friends with him - although it would of course be exceptionally interesting to find a man who had the same experience. How very lonely and dispiriting it must have been to come back after being wounded and not even be with any of your old pals, in fact, know that many (most?) of them were dead. It is true, I have not felt the need to PM myself or add myself as a friend (the other missing icon in my view). Dur. Yes, sorry about the off-topic bits, everyone. But you never know, some other idiot may have been similarly confused! Thanks (again). In the hope of re-establishing the topic, I'll just mention that I was interested to see from another thread or two to which you contributed, Mark, that the 21st Bn had the numbers starting C12000. I think you said Frank Arnold's number was a very early one in the series but that you couldn't absolutely rely on the KRRC numbering system. Hardcastle enlisted on 11 November and had the number C12190. The Crossley twins had C12390 and C12391. I suppose close numbers mean enlistment together or on the same day -in theory then one could use records to put together a battalion like this, which consisted of men who all enlisted together in a short period (Nov-Dec 1915), in order of enlistment ? Pity one can't search the CGWC records by battalion or even regiment. Moving back to topic, one of the men commemorated on one of the War Memorials I am researching was a Yeoman Rifles soldier. He was C/12452 Rifleman Richard Fisher Johnson, of B Company of the 21st Battalion. CWGC used to show his number with a Z/- prefix. He attested on 25th November 1915 at Helmsley and the Approving Officer was none other than Earl Feversham himself. In keeping with the core of the battalion he was the third son of Agnes Jane and the late Edmund Johnson who were farmers originating from Driffield in the East Riding of Yorkshire. By the time the Great War broke out the Johnsons were farming land at Barnbow between Scholes and Barwick in Elmet, near Leeds. Richard Johnson was working on another farm at the time of his enlistment, but it was a short walk from his own family farm. Richard Johnson was wounded on 15th September 1916 with a gun shot wound to the spine which caused paraplegia. He was evacuated to England and the Royal Victoria Hospital at Netley near Southampton, where he died on 30th September 1916. I suppose in one way the family were fortunate; they were able to bring him home and bury their son and brother in the local churchyard, which of course many families could not do. Frank Johnson, the youngest son of the family was also killed in the war, serving with the Loyal North Lancashire Regiment. He is buried in France. A great great cousin of mine served with the 21st K.R.R.C and d.o.w whilst serving with A company C/12492 Rifleman Alfred Agar from Wetwang a village on the wolds near Driffield. He attested on 23 Nov 1915 at Malton and joined on the 24th at Helmsley he was sent to France as part of the B.E.F on 5th May 1916. He was wounded in action i believe at Messines on 11th June 1917 and died 3 days later. He is burried at Lijssenthoek Military Cemetery. His service papers are available to view on Ancestry. 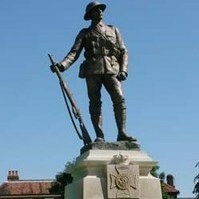 He again was a farmer and is commemorated on the Wetwang war memorial. Thank you very much, Nigel, this is fascinating. Where is the churchyard? As you say, a small consolation for the family. Hardcastle is buried at Harlebeke New British Cemetery. Rfn Johnson (is his number C12452 rather than C2452?) fits this too of course, as he was from the West Riding at the time of enlisting. He and John Hardcastle seem to have had very similar backgrounds and were wounded on the same day at Flers so I am very pleased to know about him - thanks. PS EDIT It later dawned on me that Hardcastle too was probably in B Company as Ripon was in the West Riding, not the North, so these two men have even more in common than I thought. Thanks very much Harley 1962 for this information about Alfred Agar, and I'll have a look on Ancestry. I suppose the 21st Bn would all have gone out together on 5 May 1916? John Hardcastle did too. Your cousin stayed in the 21st to the end of his life in June 1917, which might be unusual. This is becoming really interesting - thanks. Thanks very much, Lindsey. I didn't know that site. For the moment, now that some other Yeomen Riflemen are beginning to gather, I am going to wait and hope that we get a fuller picture of who they were from people on the forum who know them, if only slightly. The cemetery is the churchyard of the Church of All Saints in Barwick in Elmet near Leeds. I have since confirmed it from other sources, but my first knowledge of his company was from Rfn Johnson's CWGC page. You were right about his service number. I realised earlier and edited it. I think next time I am up in Yorkshire I'll have to look up various KRRC memorials like this. I gather there isn't much about the battalion at Duncombe Park, unless things have changed since people have written about it, but I must go and see the memorial at Helmsley. The company info isn't on Hardcastle's CWGC page. Mark may be able to tell whether it's on his record - he kindly found and transcribed it for me and I still haven't found it ...presumably because it's on the NA site but not Ancestry? I have found another man who has Feversham's signature on his attestation. You'll see he had a Military Medal and was killed or died of wounds on 5th August 1917. I found him courtesy of a Scarborough website in an extract about the 21st Bn KRRC from a book called 'Neath a Foreign Sky' by Paul Allen which seems to be unpublished except there (I'll post the link later). Does anyone know anything about this? He lists several non-farming riflemen from Scarborough whose names I will also post later but this one is included, mysteriously, because he is said to have enlisted in Scarborough. When I checked this, I found he'd enlisted in Helmsley. Anyway, he's certainly a good Yeoman Rifleman who died young - commemorated on the Menin Gate. Sleightholme was the family name of the farmers in Scholes, near Leeds when I grew up there. There was another branch of the family called Fisher. I wonder if they could be the current,or at least recent generations of these men's families? A cursory glance at Soldiers Died in the Great War shows 20 men who enlisted in Helmsley. Of these, 8 of them were Riflemen, 4 only were Yeomen though, and of the 'others' the majority, as might be expected were Yorkshire Regiment and a smattering of 'odd' men such as artillery and York and Lancaster Regiment. This is an in complete return though, as Richard Johnson's record clearly shows his enlistment in Helmsley, yet he is shown on SDGW as enlisting in York. It certainly sounds possible - it's a very unusual name. My comment about where he enlisted was a mistake caused by inexperience, sorry for misleading you. Hardcastle enlisted and had his paper approved at the same place - Ripon - and by the same person (I think - not legible) so I didn't notice that Sleightholme's paper was different in those two sections. Mr Allen was quite right, he did enlist in Scarborough, on 5th November 1915, and the approving officer on 9th November was Feversham at Helmsley. Could this be the same sort of explanation for Johnson? Now I have checked the other Scarborough riflemen's attestation papers, they are all the same in this and Sleightholme does 'belong' with them. Also he worked as a draper, though unlike them he was from a farming family. Occupation: Ladies' hairdresser. Parents: Boarding/lodging house keepers. John Bedford Rowley C/12497 enlisted at Scarborough 25th November 1915, approved at Helmsley by Feversham 29th November. Born Doncaster 1884, died of wounds 15th September 1916, Flers. Bank clerk. Mother: boarding house keeper. Harold Fowler C/12203 enlisted at Scarborough 11th November 1915, approved at Helmsley by Feversham 13th November Born Falsgrave (Scarborough) 1896, killed in action 7thOctober 1916, Battle of Transloy Ridges. Horace Pugmire C/12678 enlisted at Scarborough 1st December 1915, approved at Helmsley by Feversham (date illegible). Born Scarborough 1898, killed in action 10th October 1916, Battle of Transloy Ridges. Undergraduate at LeedsUniversity. Father: joiner. Sgt. Samuel Beecher Horsman C/12137 enlisted at Scarborough 4th November 1915, approved at Helmsley by Feversham 9 th November. Born Falsgrave, Scarborough 1887, died of wounds 7th August1917, start of 3rd Ypres but not a major battle for 21st Bn. Sgt Alfred Percival Sleightholme C/12136, enlisted at Scarborough 5th November 1915, approved at Helmsley by Feversham 9th November. Killed in action 5 August 1917, start of 3rd Ypres. The last two have consecutive numbers, enlisted on consecutive days, were both sergeants and both lasted until August 1917. I need to practise this links business for you to see the site! Can't seem to make this one work but hope you can find it using address below. Richard Fisher Johnson's attestation form shows that he enlisted at York on 25th November 1915 and then Feversham approved it at Helmsley on 26th, in the same way as the Scarborough recruits. Alfred Agar on the other hand enlisted and had his attestation approved on the same day (23 Nov) by the same person at Malton, just as happened with Hardcastle at Ripon. I've no idea why, maybe it had to do with the status of the attesting officer? Ah. Sorry Liz. My mistake. I can't even blame a late night for the error. In this specific view, the memorial tablet sits on a picture boundary, so there's a slice out of the centre missing, but if you move about, you'll get a views of the whole tablet from further back. Mark, thanks for posting those links, especially the Frank Arnold one I was trying to do in my second post. 18th Battalion King's Royal Rifle Corps especially from about post #9, where you started comparing the 18th and 21st Battalions, and 21st Battalion Kings Royal Rifle Corps (Crossley twins). By the way the rifleman discussed in the KRRC thread you have given the link for above, Bentley, enlisted quite late in December and has the number R22149, completely different from the others. I noticed RW Iley's was similar (can't lay my hands on it just at the moment - his account is quoted at length on another thread and he's mentioned a few times by Anthony Eden in his book Another World)) and being for the first time ever conscious of service numbers I wondered what this indicated- can you tell me? No apology is called for, Nigel, you've given me the very rare (on this forum) pleasure of being able to spot the reason for someone else's problem, as a result of my earnest contemplation of the Scarborough recruits' forms, and making the same mistake myself in the first place! Additional information: Son of William Abram Thompson, of 72, Ryan St., West Bowling, Bradford. Grave/Memorial Reference: Pier and Face 13 A and 13 B. Family contacted me as a result of a post on this forum and I agreed to let them have the medals. Even bought them a KRRC cap badge to go with the group. Never heard from them again? Very perculiar!! How odd. Nowt so queer as folks. Or perhaps something happened. Thompson would be in B company I suppose - West Riding? And died after Flers. I am now looking at various men mentioned by Anthony Eden in his marvellous short book Another World - 1897-1917, which is two-thirds about the Yeoman Rifles. I got it this week very cheap, second-hand from Amazon, and I'd recommend it even to people with no interest in the KRRC. His friends were in C company, naturally. Tom Liddell, C/12394, MM, born Silksworth, Durham, a butcher by trade living in Ryhope, Sunderland. Enlisted in Sunderland on 22 Nov 1915, attestation form approved by the same illegible Major who was the attesting officer. He died of wounds on 28 March 1918 serving in the 18th Bn KRRC. I haven't checked what he got his MM for but Eden says that in September 1917 when his company 'had lost all its officers and senior NCOs, Tom, then a junior sergeant, took over command as if this were the most natural event in the world, rallied his riflemen and led them to their objective which they consolidated and held'. Makes you think - if Liddell had survived the war, would he have gone back to being a butcher? 21st Battalion Kings Royal Rifle Corps (Crossley twins). Glad you followed my off-board suggestion to chase up these two threads :-) - they are interesting aren't they? By the way the rifleman discussed in the KRRC thread you have given the link for above, Bentley, enlisted quite late in December and has the number R22149, completely different from the others. I noticed RW Iley's was similar ... and being for the first time ever conscious of service numbers I wondered what this indicated- can you tell me? The KRRC/Rifle Brigade Service Number schema is a huge topic that is extensively covered here on the Forum if you do a search. The currently accepted schema is based largely on work by Irv Mortenson, and subsequently Andy and Paul Nixon, but there are a few anomalies therein that Andy, myself, Mike Durey and Johnny Conn are researching. Profuse thanks are due incidentally to Geoff Sullivan for some major assistance given to this work recently. 21/KRRC were allocated the range C/12000 through to approx C/13100. Bentley's R/22149 could variously indicate a late-enlisting New Army volunteer, a Derby scheme volunteer or a MSA conscript. Bentley in fact enlisted on 09 Dec 1915, so we can rule out the last of those possibilities. The fact that he was not allocated a C/12xxx SN might perhaps suggest he enlisted in the closing days of the Derby Scheme, opting for the deferred Group call-up during 1916, but was not allocated to a specific battalion, so was given the more 'generic' R/xxxxxx SN - the date is certainly compatible, but it's speculation really, and I have never attempted to uncover Bentley's service record to test this. This is one of the many anomalies in the schema, which really must be used as guidance only. A rifleman's battalion career can only safely be researched through the BWM medal roll. Iley's SN was C/12336, which is a standard SN for 21/KRRC, so I'm not sure what you're asking there? This was posted in a thread I began a few years ago when I was first looking into Rfn Richard Johnson. It was kindly provided by BottsGreys (Chris), and I'm sure it will be of interest and relevance in this thread, especially as the anniversary is fast approaching. Annals of the KRRC Vol. V, The Great War by Major-General Sir Steuart Hare. Pages 166-169.
was continued behind the barrage, four tanks being still in action. The infantry got ahead of the tanks, but there was little opposition. The enemy's barrage, however, was very heavy. In one place the troops were stopped by uncut wire, but two tanks came up and made gaps in it. By 8 a.m. the second objective, a trench running through the extreme southern end of Flers, had been taken, and consolidation begun. At 8.10 a.m. 4 tanks entered Flers, followed by the infantry. The tanks did most effective work hunting out machine-gun nests. The village was cleared by 10 a.m., but there was much disorganization and mixing of units owing to the heavy casualties among the officers. The village was very heavily shelled, and at one time it looked as if the troops would be shelled out of it. At 10.20 a.m. a party of about 100 men and 2 machine guns, led by Captain R. Baskett, 18th KRRC, reached the third objective, and established themselves in two works, called Box and Cox, just north of the village, in touch with the New Zealanders on their left. 10th Queen's, with as many men as they could collect, advanced against the third objective, the same trench which, farther along, had been the limit of the advance of the 9th Rifle Brigade, captured it and held it for some time against more than one counter-attack. During this time Lord Faversham was killed. This party was in the end obliged to fall back east of the village. However, by the end of the day a line was established by the Division running round the north side of the village and connecting up with the 14th Division on the right and the New Zealanders on the left. This was the greatest advance made by any division in the course of the day. The casualties of our two battalions were: 18th Battalion: officers--killed, in addition to those already named, Major P. G. Sadd, Captain J. B. Lester, Lieutenant C. N. Curwen, 2nd Lieutenant J. J. Langford; wounded 7; other ranks--killed 57, wounded 227, died of wounds 3, missing 59. Total of all ranks, 360. 21st Battalion: officers--killed, Lieutenant-Colonel the Earl of Feversham, 2nd Lieutenants T. P. A. Hervey, R. B. Nivison,; wounded 10; other ranks--killed 54, wounded 256, missing 70. Total of all ranks, 394. The 21st Battalion was relieved at 3 a.m. the next day by the 11th Queen's; the 18th Battalion was not relieved till September 18."